More than 400 trucks were stranded by heavy snowfall yesterday waiting for the reopening of the crossing to Chile. There is a white blanket of 35 cm (more than a foot) and it’s still coming down. 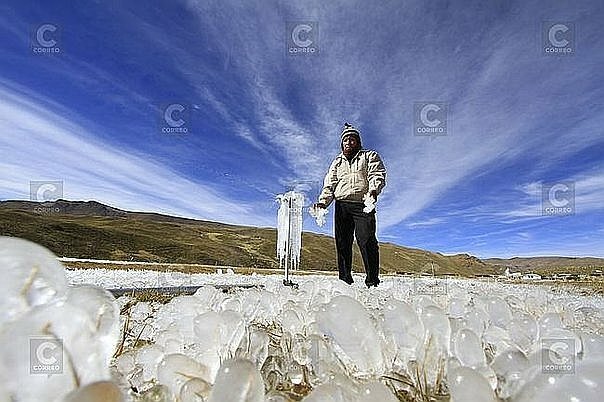 Meanwhile, the temperature dropped to minus 19.4 C in the area of Patahuasi in Arequipa. Senamhi zonal chief Gutiérrez urged residents to take protective and preventive measures to prevent respiratory diseases, especially in children and older adults. He also informed that from June 4 to 6, snowfall will be recorded above 4,000 meters. And you’re IQ is the same size as your shoes. why.. the homeland of the pope is Argentina, and this news is about the mountain pass between Chile and Argentina called “Cristo Redentor”. And was true. Im live in Chile. If the temperatures drop and snow increases it is due to Global Warming. If the temperatures rise and snow decreases it is due to Global Warming. If the temperatures remain the same and the weather just exhibits normal variations it is due to Global Warming. What part of “the science is settled” are you missing? Any climate is Global Warming and caused by my 5.7 Hemi. I sure hope you are joking and not buying into the Al Gore crowd! South America is in the Southern Hemisphere, where winter has just started. I visited Chili and Argentina in December 2000, and experienced snow.